Ready to change the old, noisy tires on your vehicle to those that’ll give you a better and quieter ride? Well, there are lots of options to choose from especially if you are looking for tires that can deliver a blend of reasonable tread life, good traction, and minimal road noise. In this guide, you’ll learn what to consider when choosing the quietest tires on the market. Just as tires come in different sizes, so also do they cater to different speed and weight limits. In the car aspect ratio, you’ll find good information on how much load a tire can handle and the maximum speed the tire can safely carry the load. The higher the load the tire can hold, the more the noise it’ll generate. Also, a tire with higher speed capabilities will generally operate at higher noise levels. Therefore, it’s important to consider these two points when looking at a tire that can deliver a quiet ride. Road traffic noise is a serious and widespread threat to public health. Public authorities have to cover the cost of sound insulation noise, barriers, or health services, but one of the most effective and low-cost ways to reduce traffic noise is to fit cars with quieter tires. As a result, there are government agencies set up to monitor the production of new car tires and to ensure they have little to no noise discharge. Some laws, especially in the EU, requires that car tires meet minimum noise emission standards in a controlled test before being released into the market. Selecting tires that have noise reduction mechanism built into the tread pattern such as the likes of Continental and Goodyear brands allows for a much smoother and quieter ride. Many manufacturers and tire engineers are now making efforts at producing tires with optimized tread design all in the bid of reducing noise levels. Newer models from Continental, for example, have the ContiSilent feature, a tire noise-reducing technology and other tire models such as the Dunlop Grandtrek AT20, have features that are specifically designed to provide a comfortable, smooth and quiet ride. Before buying a particular brand, make sure to review the product page to understand how much features are dedicated to noise canceling. The bigger the wheel on the car, the more noise is likely to be produced. This is because wider tires have more rubber hitting the ground, causing extra friction that leads to more noise. Because thinner tires have less contact area with the road surface, road noise is greatly reduced. They also provide you with more driving comfort as fewer surface imperfections on the road is transferred to you. Moreover, they have lower rolling resistance, which helps you save more on fuel. So think, again before adding those massive alloys if you truly want to enjoy a quiet ride with your family. 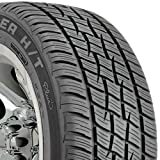 With a good reputation for making reliable tires, Goodyear didn’t disappoint with the Wrangler Radial Tire, which is designed to fit a wide range of car models. This model is designed for light trucks and SUVs and is eligible for the Goodyear Replacement Limited Warranty. Thanks to the tire’s optimized tread design, you can now enjoy maximum performance and dependable traction in a variety of road conditions. The tire features large tread blocks, which offers a stable footprint and improved handling in both dry and wet road conditions. If you are looking for a tire that can hold its water in different weather conditions, this is a good option. With its robust tread pattern and design, the tire helps you maintain stability at varying speed levels. And if you are an aggressive driver who doesn’t like to slow down for turns and curves on the road, you’ll want to consider getting this for your vehicle. It’s designed for aggressive driving and will wear reasonably well. This tire is great for driving in the wet and dry pavement but does not provide good traction in the snow. In addition, some users complained of experiencing sidewall failure while using the tire, although this is due to improper installation. To avoid this problem, this tire should only be mounted on 6″ wheels or lower. Generally, mounting on anything wider than that will cause sidewall separation or bubbles, which will eventually cause the tire sidewall to fail. The Continental ExtremeContact DWS is Continental’s all-season tire, featuring extended tread life and stronger sidewalls. It’s a tire that is designed to work all seasons of the year hence the name. With this tire, continental is building on a proven design. The new tire’s aggressive looking, asymmetric tread pattern has a strong family resemblance to its predecessor. Its new silica-enhanced all-season tread compound and more stable internal construction are tuned to provide responsive handling and reassuring traction in dry wet and winter conditions. Specifically, the silica tread compound is designed to extend tread life and maximize durability even in the most extreme conditions. One of the unique features of this tire is that it has markers that indicate improper car alignment. The alignment verification system alerts you when the vehicle’s alignment needs to be checked. Usually, for you to detect alignment issues, you’ll need to use the alignment rack or have a good visual inspection of the tires. Even with that, the visual indicators don’t raise the alarm on an improper alignment until it’s late and you can save the tire anymore. The DWS is constructed with Continentals leading-edge Sport+ Technology that provides an enhanced driving experience for your luxury sports sedan or coupe. The leading-edge Sport+ technology improves cornering and handling to keep you on the road with confidence. The tire features a 35% stronger sidewall than the previous generation, which helps as the car rolls down the blacktop freeway or highway smoothly. This sidewall is going to have a bit more consistency to it and also its a protection against blow-outs from any sort of road hazard that comes into contact with the tire. The tire also comes with an X-Sipes technology, which is a criss-cross groove technology that’s designed to cut through rain, puddles, and standing water. In any of these conditions, it’s going to maintain good traction and keep you moving smoothly. The Optimo H724 is Hankook’s all-season touring tire that’s designed to provide vehicle owners with good traction and handling. If you own one of minivan, sedan, coupe, or a small pickup, this model is a good option. Because it’s used as original equipment for new cars, replacing it with your OEM will make no difference. The Optimo H724 comes with deeper grooves, which ensures an increase in dry traction handling and thanks to its continuous center rib, you’ll enjoy excellent steering response on wet road surfaces without compromising stability. To ensure smooth driving through slush and uneven pavement, Hankook incorporated multiple sipes around the tire to bring the grip up to respectable levels. And with 4 circumferential grooves that are computer-optimized, the threat of Aquaplaning is greatly minimized when you are driving through wet road surfaces. The grooves prevent the layers of water from building up between the wheels of your vehicle and the road surface, thus making your ride lustrous and unhindered. Furthermore, this tire provides less steering wheel vibration, which makes for greater comfort and a strong feeling of stability. What’s more, Hankook is offering 70,000 miles tread guarantee on the H724 All-Season Tire while also allowing you to choose either an S or T-speed rating, which is a suitable speed rating for this touring tire. If you are looking for an all-season, touring tire for a 14/15″ wheel size vehicle, this model is highly recommended. The Discoverer H/T Plus Tire is designed for sport utility vehicles and full-size pickups and can be used as both replacement and original equipment. 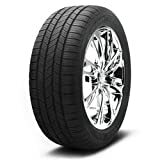 It’s available in both 18 and 20″ sizes and comes with a non-directional tread pattern that utilizes a rounded tread profile, which provides for lasting tread life and balanced performance. To enhance the tire’s wet road handling, Cooper included wider lateral slots and see-through grooves. This, along with high-density sipe placement in the tread pattern, facilitates easier handling in snow, ice wet weather conditions. For added strength and ability, the Discoverer H/T tire comes with two steel belts with nylon reinforcement. And if you have expensive custom wheels, the built-in rim protector in the tire will help in preventing curb damage, thus giving you a much more fulfilled driving experience. Moreover, this model comes with a limited warranty, which includes free tire replacement for the first 2/32 inch of wear, as well as materials and workmanship, which are covered for 5 years. Unlike other tires in its class, Cooper Discoverer H/T Plus All-Season Tire comes with a uniquely optimized treat pitch sequence that helps in minimizing road noise. This makes it one of the quietest tires on the market. The Grandtrek AT20 All-Season Tire comes with an increase in braking and cornering performance, thanks to the Dunlop’s VersaLoad Technology and intermediate tread blocks. Just like the Cooper Discoverer H/T, the Grandtrek AT20 also comes with multi-pitch tread design, which helps in getting rid of too much road noise. The tire comes with 60,000-mile tread warranty, 2-year roadside service warranty, 6-years materials, and workmanship and is available in 15-18″ sizes. 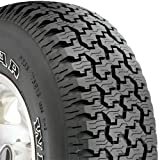 To ensure that the tire provides maximum comfort and drivability, the maker also included their unique bead apex and dimensional stable polyester body. If you have a lightweight SUV in need of an all-season car tire, this model is an ideal choice. However, using it on heavier trucks or SUVs can greatly reduce the tread life. While this model has good overall performance, it doesn’t perform well in winter and doesn’t do well in deep snow condition. Although the tire has cross-cut sipes and wider circumferential grooves for improved traction on wet pavements, it has a poor performance in winter. If you are looking for a quiet ride that can serve you well through winter, you may want to look at other all-around performance tires like the Cooper Discoverer or Goodyear Wrangler Radial. Overall, this model is a great fit if you are looking for a quality tire that will provide you a comfortable drive. This is a luxury, all-season performance tire designed for a long way or comfortable ride with best-in-class wet braking. This tire is basically designed for drivers of high-performance sports sedans and for everyday run-of-the-mill cars like a Toyota Camry, Honda Accord or small crossover vehicles like the Toyota rav4 and Honda CRV. Cars like the Subaru Legacy or the Ford Fusion will be a good candidate too. The tire features a soft compound for good grip and low road noise. It also has an asymmetric tread pattern mainly designed to make the tire last longer and the grooves on the tire are designed to hold snow in the tread and improve traction in the snow. The tire uses the Eco-Plus technology which enhances fuel efficiency as well as the tread life, making it a good option for anyone looking for a high-performance all-season model. Continental’s engineers included ComfortRide technology, which provides additional cushioning and absorbs road vibrations. This technology is designed to significantly reduce road vibrations transmitted back to the driver and passengers, thus making for a comfortable ride. One interesting fact about this tire is the three letters molded in the tread pattern (D, W, and S). D is for dry, W for wet, and S for snow and they wear out at different times. The first one to wear out is the snow, the second one is the wet and third is dry. So, when the snow (S) wears out, it’s no longer safe to drive in the snow. The same thing applies to the other letters too. This gives you a sense of safety and keeps you well informed of the conditions of your tire. The General AltiMAX RT43 is a stylish all-season touring tire that’s perfect for driving to work, school, or to pick up the kids. This tire comes with the General Tires exclusive monitor technology, the replacement tire monitor (RTM) technology and visual alignment indicator VAI. The VAI is a system of sight made up of two shallow sights and one deep sight. In the first few thousand miles, a misalignment condition can cause one shoulder to wear faster than the other. With excessive toe in, the outside shoulders can wear faster than the inside shoulder. The two shallow sights on the outside shoulder, when worn out, signify the need to check vehicle alignment. The Altimax RT43 utilizes lateral grooves and binding edges to increase snow traction without reducing mileage. The abundant binding edges are responsible for ensuring a smooth ride on surfaces like wet pavement and snow covered roads. These binding edges grip the snow-covered roads for maximum traction. In addition, General tires Engineers developed construction elements for an increase in the life of the tire. These new elements reduce tread distorting which lowers surface abrasion. Lower surface abrasion extends the life of the tire, creating excellent consumer value. As the tire reaches the end of its tread life, the replacement tire monitor letters transform into “Replace Tire”. Thus, AltiMAX RT43 gives the vehicle owner an added measure of security by indicating the need to replace tires. The Goodyear Eagle LS Radial Tire is a tire you can trust to get your family everywhere it needs to go. From soccer practice to the grocery store, it’s optimized for a smooth driving experience and provides a quiet ride you can trust. And it’s just as durable as it’s comfortable, which makes a great value over the long haul. Plus you’ll feel good knowing the wide grooves in the tread pattern have been designed to push water away from the tire to help prevent hydroplane. Its small zig-zag micro-grooves offers enhanced traction in rain, snow, and dry pavement, which is why leading vehicle manufacturers choose it for a number of their most popular pickup trucks and SUVs. In addition, this luxury sports tire is a hybrid passenger tire that provides a nice, comfortable ride with a low profile. The asymmetric tread pattern enhances grip and stability to help keep you safe on the road even at highway speeds. 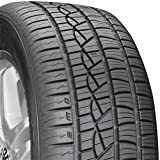 The Bridgestone Dueler features a streamlined and rounded casing that provides you with responsive handling while water channeling grooves pushes water away from the tire surface for enhanced traction in wet road surfaces. Because it has to last all season it needs to also have longer tread life. So, if your car has non-staggered wheels, you can expect up to 50,000 miles on this tires since your tires can rotate all the way around. However, if your wheels are staggered (which means that the front is smaller than the back in width), you won’t be able to do full rotation but you can still get up to 25,000 miles, which is still okay. That estimation applies if your car is properly aligned. With the correct alignment, you’ll be able to get balanced wear throughout the tire provided you are not constantly hitting the road at a bend or curve. Not only will your vehicle be able to maintain its speed, but you’ll not wear out your inner sidewalls quickly. The tire also gets a firm grip in light snow, thanks to the wide notches and anti-hydroplane safety technology on it. One of the greatest strength of this tire is the Bridgestone exclusive UNI-T technology, which helps in providing dependable dry traction and accurate handling performance. This touring tire features Goodyear’s luxurious patented comfort layer in the tread and deluxe comfort edge in the sidewalls. Together, these dual comfort zones provide up to 20% more cushion than your typical passenger tire, no wonder it outperforms the leading competitor for comfort. The tire also contains wide grooves, which are designed for all season traction – giving you more control over those wet sloppy roads. And it’s just as attractive as it is assertive, enhancing the look of every vehicle with a touch of elegance. A combination of circumferential grooves, independent shoulder blocks, and siped intermediate tread blocks enhances traction in varying weather conditions. The tire is available in 15/16/17″ sizes with 1-year uniformity warranty and 6 years/50,000 miles tread life warranty. This model is one of the lowest priced tires on this list, with the manufacturer purposely lowering the price to attract budget-conscious buyers. However, it has a poor treadwear, which makes it rank lower among its peers. That said, if you don’t want to spend too much on a new set of tires or just need a decent cheap tire for an older vehicle, you should definitely consider this model. When it comes to buying new tires for your vehicle, there is an abundance of options to choose from. However, when you have your own criteria such as choosing the quietest tires on the market, the choice is significantly withered down to few models. As you can see, it’s no longer about the price but rather this specific feature that’ll help you bring to life those quiet rides you’ve been dreaming about. Out of the models reviewed in this guide, the most reliable option is the Continental PureContact Radial Tire as it comes with adequate features that enable it to deliver a blend of reasonable tread life, good traction, and a quiet ride. The Continental PureContact Radial Tire features a computer-optimized asymmetric tread design that reduces pattern noise for minimal road noise. It also comes weight-optimized construction, which helps in reducing weight and rolling resistance for more fuel economy.